As mentioned my current idea for my installation is to create an installation which has an object track the face of the user and then using a particle system it will draw where the user has been. As a part of the brief is that the installation has to reflect a media concept that I believe is important to 21st century use of the media. When thinking about what media concepts that this project could reflect the idea of a digital footprint came to my mind. This is because as Madden et al describes "A digital footprint is the data that is left behind by users on digital services" (2007). The idea of a digital footprint is becoming much more important now. This is because as the internet becomes increasingly more important and almost consuming of people's lives, people are becoming more "aware of the information that remains connected to their name online" (Madden et al 2007). 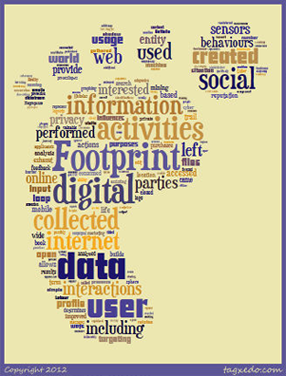 The idea of digital footprint I believe links to my project. This is due to the fact that within my project the user moves an object throughout an environment, which is similar to a person navigating through the internet. The idea of a digital footprint also links to this installation, because as the user navigates the object around the "world" the particle system creates a track of where the user has been. This links to the idea of a digital footprint because as people leave a trail of data when they navigate through the internet, the users are leaving a trail when they are moving the object around the environment. I believe that this idea of a digital footprint does work in terms of this project because, one the project does atristicly represent the idea of a digital footprint, in the the user does leave a trail. Secondly because the this idea of a digital footprint is one that I believe is becoming increasingly important. This is because with the increasing use of social media people are leaving an increasingly large digital footprint, which is becoming to the point where you can search a persons a name on the interent and within a few minutes can have a large amount of information about the person. So this is I think makes this a good media concept to use in this project because it is an incredibly important concept within new media. Madden, M., Fox, S., Smith, A. and Vitak, S., 2007. Digital Footprints: Online identity management and search in the age of transparency. Pew Internet, Available from: http://www.pewinternet.org/files/old-media/Files/Reports/2007/PIP_Digital_Footprints.pdf.pdf [Accessed 6 January 2015].